Alternative metal fans, we’ve got an exciting show coming up for you at the DTE Energy Music Theatre!! That’s right, Shinedown are embarking on the 2019 run of their Attention, Attention tour, in support of their latest concept album of the same name. They’ll be hitting Michigan’s premier live concert venue on Saturday 13th July 2019 – tickets are gonna fly so grab yours while you can and get ready for the show of a lifetime!! With more than ten million records sold around the world, Shinedown are one of the most popular alternative metal bands in the world, with multiple singles hitting the number one spot on the Mainstream Rock Charts. The follow-up to their 2015 album “The Sound Of Survival,” the amazing “Attention Attention,” is a concept album centering around an individual overcoming adversary and becoming reborn as a new person. The album was adored by fans, and released to rave reviews from critics too. Are you ready to hear all the new songs live?? This concert is going to be nothing short of EPIC – don’t miss it!! 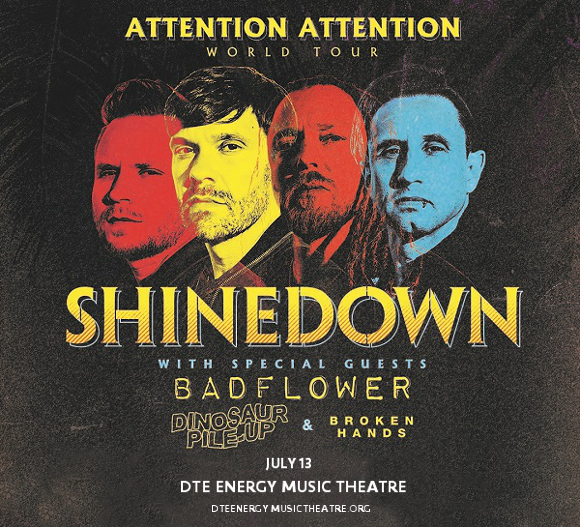 Get your SHINEDOWN tickets now while they last! !